Jack Snipe feeding in a ditch, note the short tails. Note the distinctive broad cream stripes down the birds back. The bill of the Jack Snipe is short for a Snipe. Also note the dark crown with no central stripe. The Jack Snipe constantly bobs when feeding. The Jack Snipe has a blackish-purple back with long, broad cream stripes, it's underside is white and it's breast is streaked brown. 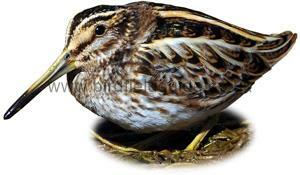 The bill is medium length (Short for a Snipe) and straight and the head is striped with brown and cream. Breeds in Northern Europe and Russia, moves South in winter to several areas in Europe including the UK. Stays on breeding grounds until late September, much later than other Snipes. Nests in boreal marshlands, sometimes on floating bog-weed, but occasionally on drier ground near bushes. In winter it is found mostly around inland freshwater marshes, which have extensive long grasses and rushes. 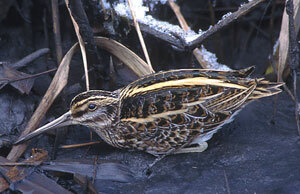 The Jack Snipe is much smaller than the Common Snipe, it also looks much darker. It is rarely seen flying and prefers to scuttle away into vegetation.